Sarah's Journal: THE DEEPEST BLUE comes out today!!! 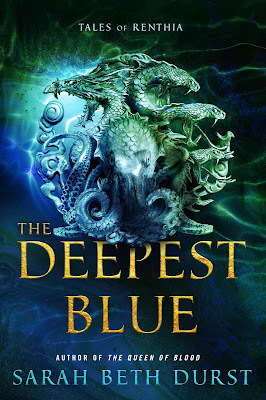 Today is the book birthday for my newest book, THE DEEPEST BLUE!!! And I'm so excited to share it with you for two reasons: One, I loved writing this book so much! Two, this book has sea monsters. THE DEEPEST BLUE is a standalone epic fantasy for adults, published by Harper Voyager. Mayara, a fearless oyster diver, is about to marry the love of her life when an unnatural storm hits her island, and wild spirits from the sea ravage her village. To save her loved ones, Mayara reveals a dangerous secret: she has the power to control the spirits. When the storm ends, she is taken into custody by the queen's soldiers and imprisoned with other women like her. They are sent to an island filled with bloodthirsty nature spirits, and left without food, water, shelter, or any tools except their own instincts and magic. Whoever survives the Island of Testing will be declared heirs to the queen. But no matter if she wins or loses, Mayara knows that the life she dreamed of is gone. When I first created Renthia, I drew a map. I could see it all so clearly: A world with out-of-control nature spirits would be a world of extreme natural beauty, as well as danger. Lothlorien-like forests with cities nestled in the branches. Mountains so high they pierced the clouds. Endless glaciers. And an ocean filled with sea monsters. In the Queens of Renthia trilogy (which starts with THE QUEEN OF BLOOD, continues with THE RELUCTANT QUEEN, and concludes with THE QUEEN OF SORROW), I got the chance to explore the forests of Aratay and the mountains of Semo. I wanted to know what was happening on those islands I'd doodled to the south. How did the people there live? How did they survive the spirits and the sea? "On the dawn of her wedding day, Mayara knotted her diving belt around her waist and climbed the skull of a long-dead sea monster." Mayara is fueled by the love in her life -- the love of her husband, her family, and her friends. And that is what enables her to face the krakens, sea dragons, and other monsters of her world. Even though I'd never dive through the eye socket of a leviathan's skull, I am fueled by those same things. So I'd like to take this moment to say thank you to my friends, my family, and my readers for giving me strength and for being so wonderful!